With +/- 3 weeks to go I thought I should share our daughter’s nursery with you. I had a tough time designing this at first because of various issues. 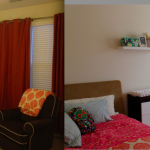 I wanted to keep the custom burnt orange curtains, and I wanted to keep the guest bed in the room for visitors. One wall is all windows, another has 2 closets (one of which houses our HVAC unit), and a third has the window. I wanted to get a glider but didn’t know where it would go – it was the one thing I was missing when Raffi was an infant and I was up nursing at all hours of the night. 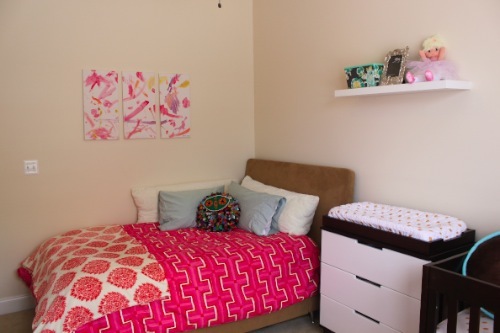 I had several trial and errors until I came up with a room that I absolutely love being in that is also practical. It isn’t finished yet and probably won’t be for another year or two, but I absolutely adore it so far. We decided to make her room more of a big girl room with nursery elements to allow her to grow in it for years to come just like we did with Raffi’s. I found a piece of art I loved and used that as the inspiration for the rest of the room, heading back to that art when making every decision. I did the same with Raffi’s room, using his rug as the inspiration. 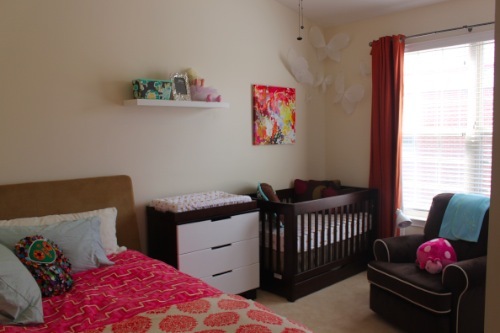 Here is our bright and happy girl’s nursery! Click the below for a before and after! And here is the art Raffi created for his sister. I taped 3 canvases together and had Raffi use big paint brushes and a cut up sponge to paint the canvas with washable paint. 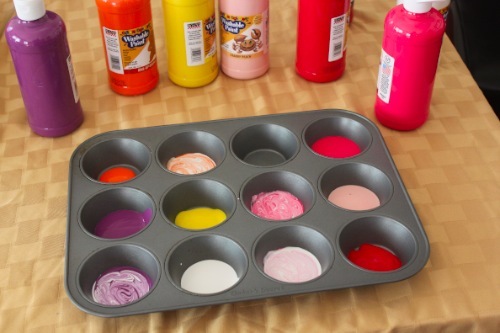 I bought the paint from AC Moore and mixed different pinks, reds, yellows, peaches and purples in a muffin tin and let him do his thing. I had to encourage him to paint different sections instead of painting the same section over and over again, but besides that it was all up to him. We talked a lot about how he was painting something for his baby sister, and when Trig came home from work that night Raffi couldn’t wait to show him his creation. He was wildly gesticulating and blabbing about the art – the only words I understood were colors, yellow, and baby. I think this art is the most precious thing in the whole room. 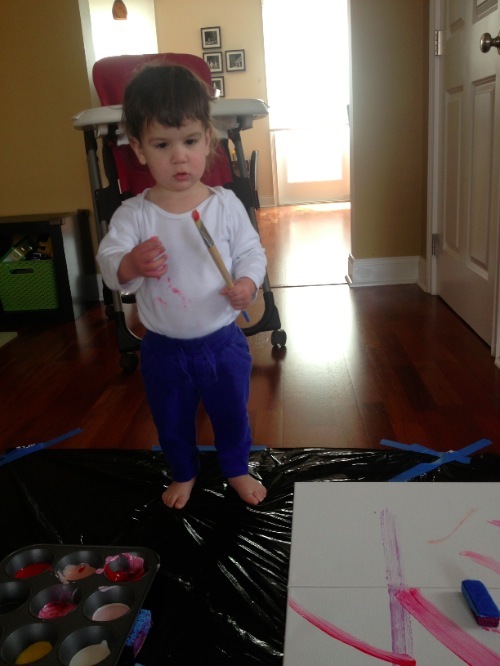 You can read more about how we are preparing Raffi to be a big brother in my latest Babycenter post. 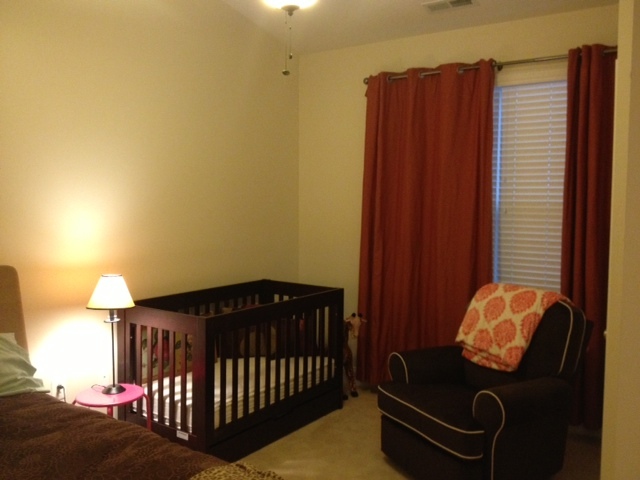 I can’t wait to enjoy this room with our daughter. Only a few days left! *If I missed anything and you’d like to know where I found it just ask! 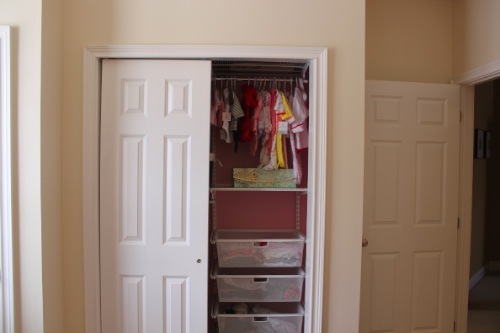 **Here is Raffi’s room in case you need a reminder. It looks beautiful!!! Hooray! Wow just a few days?!!! Beautiful! 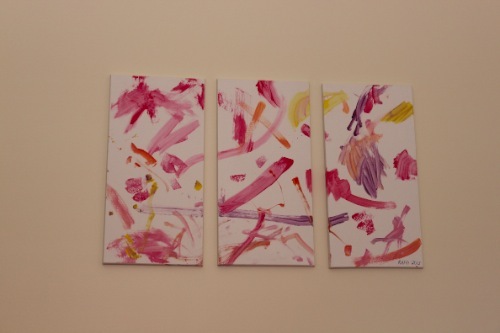 I love that you had Raffi make the artwork for his little sister’s room. I think it’s a wonderful touch and Raffi’s handiwork is great! What an artist! Looks great. 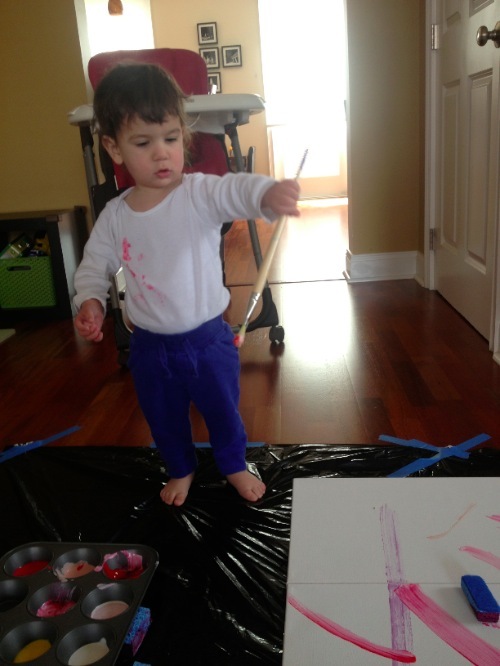 Very cute that Raffi painted art for his sister!! I love the use of space. I also think it’s great how you have integrated R into helping create his sisters room.